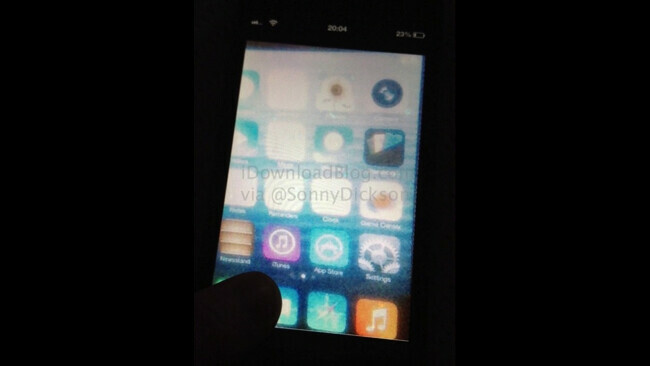 A picture published on Monday allegedly reveals the new UI of iOS 7. Developed by Jony Ive after Scott Forstall left the company, the design has been characterized as being flat, without the glossy skeumporphic icons that became associated with the OS. While some believe that the leak is genuine, it could be an early design and might not portray what the public will see when iOS 7 is unveiled at WWDC next week. That impression seems to come from those who have noticed that some of the icons look different than others, as though different teams developed different icons. Some have borders and some still have a bit of gloss to them. There are more questions surrounding the leaked picture, including the use of the wooden Newstand icon which would seem to violate the no-skeumorphics approach that Ive has been purportedly aiming for. There also seems to be too much white space between the status bar and where the icons begin. And lastly, there is something unsettling about the angle of the icons on the screen. 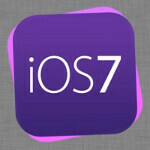 With only a week left until iOS 7 is introduced, we'd expect some more images to leak before the introduction of the real thing. Stay tuned. If they want to give us a leak, at least make it look credible. Wow! Innovation at its peak! well said, I hope they don't leaked it. seriously, in the world of tech we live in, nobody credible will think about taking a picture of something like that, with less then their best picture taking skills. No dude. Can't you see innovation? If trends keep up were looking at a full fledged iphone remote in a few years. I think this is it. It didn't look that flat to me but it looks like it's something apple would do. The icons did certainly change but they didn't change much either. (Well it looks more or less the same) I'll hold my judgement until I see the real thing. This is more than likely a Cydia theme applied to iOS 6 and then photographed (or possibly a screenshot) and pulled up on someone's screen. Notice how the image doesn't fit properly on screen? lol. its so hard to tell sarcasm on text, but you executed that perfectly rendom person!! This is a bad picture. Was it taken with an iphone?